Egypt was conquered by Alexander the Great in 332 BC, while Egyptians offered very little resistance and even welcomed the Macedon conqueror. Egypt became part of the Empire of Alexander the Great who died in 323 BC without naming his heir which resulted in the outbreak of a war for his empire among his generals - the diadochi: Antigonus I Monophthalmus, Ptolemy I Soter, Seleucus I Nicator, Lysimachus and Cassander. Since Antigonus was the strongest the other four diadochi joined their forces against him. Antigonus was defeated and the former Empire of Alexander the Great was divided among his generals into five states. Egypt passed to Ptolemy I Soter who proclaimed himself King of Egypt in 305 BC and founded the 31st dynasty commonly referred as Ptolemaic Dynasty which ruled Egypt until the Roman conquest in 30 BC. Ptolemaic Egypt reached its height under rule of the first Ptolemaic pharaohs - Ptolemy I, Ptolemy II and Ptolemy III. Ptolemaic rulers did not change the political system nor the ancient Egyptian culture. The traditional religious beliefs continued and Ptolemaic rulers of Egypt were accepted by the Egyptians as both pharaohs and divine beings. Ptolemaic pharaohs also retained strictly hierarchical, centralized and bureaucratic system which was present in all segments of life: government, administration, army, jurisdiction and even finances and economy. City of Alexandria which was founded by Alexander the Great in 331 BC became the capital of Ptolemaic Egypt. Ptolemy III was after his death in 221 BC succeeded by his son Ptolemy IV who was unable to continue successful policy of his predecessors although he managed to repulse the attack of Seleucid ruler Antiochus III the Great at the Battle of Raphia in 217 BC. However, series of rebellions broke out shortly after the triumph at Raphia which were particularly serious in southern Egypt and greatly weakened economic power of Egypt as well as the power of Ptolemaic pharaohs. 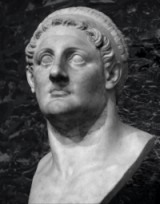 Decline of Ptolemaic power became obvious after death of Ptolemy IV in 204 BC. His son and successor Ptolemy V was at the time of his death minor, Antiochus III and Philip V of Macedon concluded a secret treaty to seize Egypt. Helpless against allied Seleucid and Macedon forces Egypt was forced to conclude an alliance with the Rome which eventually led to Roman interference into Egyptian affairs. The last and the most famous Ptolemaic pharaoh was Cleopatra VII who ruled Egypt from 51 BC until her death. Cleopatra tried to reestablish the power of Egypt and to get loose of Roman influence first through Julius Caesar and after his assassination in 44BC through Mark Anthony. However, her influence greatly angered the Romans and Octavian (later Emperor Augustus) declared a war against Cleopatra and Mark Anthony. Joined forces of Mark Anthony and Cleopatra were decisively defeated by Octavian in the naval Battle of Actium in 31 BC, while Mark Anthony and Cleopatra retreated to Alexandria to defend themselves from Egypt. However, they failed against the Roman army led by Octavian and both Mark Anthony and Cleopatra committed suicide. With Cleopatra’s death in 30 BC the Ptolemaic Dynasty became extinct. Her son from relationship with Julius Caesar - Caesarion, later Ptolemy XIV was assassinated on Octavian’s order, while Egypt became a Roman province.